Let's start with a couple of DIY projects. We were given this little folding chair a few years ago and it has been well-used. So now it kind looks, um, ewww. I decided to recover it. I'm moderately happy with the outcome. I just don't know how sturdy it will be. The original cover is actually sewn around the seat frame on each side (you can kind of see it in the picture above). I couldn't do that on my machine so I used decorator-strength Velcro. I'm just not sure how much weight it will hold. Cute, though, right? And then I had an epic fail. Now usually I can visualize the final outcome in my head. Some wires in my brain definitely got cross on this project. The original clock (salvaged from the city clean-up a few years ago). Actually it was just the outside frame, which I think might have been part of an old-fashioned dressed. Mark added the center portion and we turned it into a clock. First DIY redo: I decided orange would be a nice change. But I decided against bright orange, instead choosing cantaloupe. And then decided to add some whopping big numbers. Epic fail. Or rather, EPIC FAIL. This photo really doesn't do the color justice. Think ripe juicy cantaloupe. Really not a bad color. Just not the right color for this project. And the numbers. Well...what was I thinking?? Second DIY redo: I used some apple green (think Granny Smith) paint leftover from my office (which I love by the way) on the outside. Chalkboard paint on the rest of it. Stencilled in the numbers with chalk. Weather report on the top. Good to go. We went to an appreciation dinner at a newly completed house. The homeowners had dinner for all the subcontractors who worked on this remodel (Mark did the cabinets throughout the house). Beautiful home. I saw this on instagram the other day. I must be a much better writer/artist than I thought, because a lot of the time it's uncomfortable putting myself out here in blogland. And then I saw this on instagram the same day. 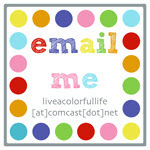 Pantone! along with this picture. My mother, Gabriel's great grandmother, was sick the day of the party.Too bad, because I know she would have enjoyed being part of this family photo. And finally, who wouldn't want this car? I had to be super quick to snap this photo, and it really only shows a few of all the colors. While posting all these random things from the last week, I am reminded these really are just random and really inconsequential. My thoughts and prayers go out to everyone touched by Superstorm Sandy. So what random things do you have to share? Love the moustaches! Do you have Movember in the States? It is a fund raiser for men's health here in Australia. Men are encouraged to grow a mo! Very cool chair makeover! And your clock came out great too (in the end)! Great randomness. I think the chair looks awesome so I hope it works. Guess if that car got in an accident they could painlessly replace any damaged part without having to repaint!! I love your DIY projects....especially the little chair! Phew, you rescued the clock! Also, coveting your chair, even though i know it is a sin to covet thy neighbors property. I hope it holds up well! Oh Cindy - those huge numbers!? I bet the hands wouldn't even have been able to go round! And the velcro chair - keep a camcorder focused on that one, it has You Tube written all over it! Great DIY projects! You ARE an artist, AND a wonderful writer. Great post. Love the chair. Love the clock! Really clever! Love the Pantone. Love the 'staches! Golly, I was so busy today, I forgot it was Thursday! Argh! The epic fail was only temporary - I love the chalkboard clock! Very cute chair. And I think the Velcro will hold--don't they use that on kids' shoes? 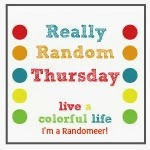 Fun to read this random day blog of yours every Thursday. I immediately Pinterested the quote about artists (is Pinterested a word?). Great thoughts, and love that clock!